The purpose of this article is to show some common Excel tasks and how you would execute similar tasks in pandas. Some of the examples are somewhat trivial but I think it is important to show the simple as well as the more complex functions you can find elsewhere. As an added bonus, I’m going to do some fuzzy string matching to show a little twist to the process and show how pandas can utilize the full python system of modules to do something simply in python that would be complex in Excel. Make sense? Let’s get started. The first task I’ll cover is summing some columns to add a total column. We will start by importing our excel data into a pandas dataframe. We want to add a total column to show total sales for Jan, Feb and Mar. As you can see, we added a SUM(G2:G16) in row 17 in each of the columns to get totals by month. Performing column level analysis is easy in pandas. Here are a couple of examples. Now, we want to add a total by month and grand total. This is where pandas and Excel diverge a little. It is very simple to add totals in cells in Excel for each month. Because pandas need to maintain the integrity of the entire DataFrame, there are a couple more steps. 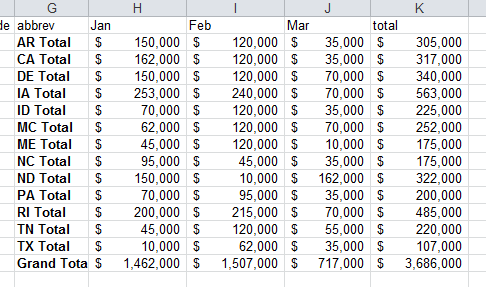 First, create a sum for the month and total columns. This is fairly intuitive however, if you want to add totals as a row, you need to do some minor manipulations. We need to transpose the data and convert the Series to a DataFrame so that it is easier to concat onto our existing data. The T function allows us to switch the data from being row-based to column-based. The final thing we need to do before adding the totals back is to add the missing columns. We use reindex to do this for us. The trick is to add all of our columns and then allow pandas to fill in the values that are missing. Now that we have a nicely formatted DataFrame, we can add it to our existing one using append . For another example, let’s try to add a state abbreviation to the data set. From an Excel perspective the easiest way is probably to add a new column, do a vlookup on the state name and fill in the abbreviation. You’ll notice that after performing the vlookup, there are some values that are not coming through correctly. That’s because we misspelled some of the states. Handling this in Excel would be really challenging (on big data sets). Fortunately with pandas we have the full power of the python ecosystem at our disposal. In thinking about how to solve this type of messy data problem, I thought about trying to do some fuzzy text matching to determine the correct value. Fortunately someone else has done a lot of work in this are. The fuzzy wuzzy library has some pretty useful functions for this type of situation. Make sure to get it and install it first. The other piece of code we need is a state name to abbreviation mapping. Instead of trying to type it myself, a little googling found this code. Get started by importing the appropriate fuzzywuzzy functions and define our state map dictionary. Here are some example of how the fuzzy text matching function works. Now that we know how this works, we create our function to take the state column and convert it to a valid abbreviation. We use the 80 score_cutoff for this data. You can play with it to see what number works for your data. You’ll notice that we either return a valid abbreviation or an np.nan so that we have some valid values in the field. We use apply to add the abbreviations into the approriate column. I think this is pretty cool. We have developed a very simple process to intelligently clean up this data. Obviously when you only have 15 or so rows, this is not a big deal. However, what if you had 15,000? You would have to do something manual in Excel to clean this up. For the final section of this article, let’s get some subtotals by state. In Excel, we would use the subtotal tool to do this for us. Next, we want to format the data as currency by using applymap to all the values in the data frame. The formatting looks good, now we can get the totals like we did earlier. Convert the values to columns and format it. Finally, add the total value to the DataFrame. You’ll notice that the index is ‘0’ for the total line. We want to change that using rename . By now, most people know that pandas can do a lot of complex manipulations on data - similar to Excel. As I have been learning about pandas, I still find myself trying to remember how to do things that I know how to do in Excel but not in pandas. I realize that this comparison may not be exactly fair - they are different tools. However, I hope to reach people that know Excel and want to learn what alternatives are out there for their data processing needs. I hope these examples will help others feel confident that they can replace a lot of their crufty Excel data manipulations with pandas. I found this exercise helpful to cement these ideas in my mind. I hope it works for you as well. If you have other Excel tasks that you would like to learn how to do in pandas, let me know via the comments below and I will try to help.